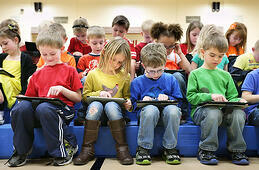 iPads in the classroom make great learning tools that can provide unlimited benefits in education. Students and teachers alike love the engaging activities the iPad can provide, so their rapid proliferation into schools all over the country is no surprise. Despite all the possible benefits, iPads in the classroom do create new challenges for IT departments ranging from new sets of securities, configurations and management. Check out these 3 big issues with iPads in the classroom and how to solve them. iPads can make great learning tools, but they require a strong and reliable signal strength. If not, they are useless. To avoid the issue of having all these great devices that aren’t working due to insufficient signal strength, first you should thoroughly test your internet connection speed. Make sure you test it throughout all different times of day throughout all parts of campus. Since most schools are doing a 1:1 implementation of iPads in the classroom, you need to make sure your school wireless network can support such a large volume of devices without forfeiting sufficient network speed. Once you decide how many iPads you will have accessing your network, make sure you test your network with all the iPads connecting simultaneously. Make sure your school wireless network can handle all these devices successfully with signal strength being distributed evenly and reliably. iPads are all about the apps. There are a ton of educational apps out there that are great, but they require internet connection. So, you must determine how the iPads will connect to the wireless network. Some options are connection through a separate guest network or maybe a student guest network. You need to see if the wireless network has the ability to create a separate policy that identifies iPads on your existing school network, giving them different access rules or web filtering. If it doesn’t this is something you definitely want to look into getting. Of course safety is a big concern for any school implementing iPads in the classroom. A mobile device management (MDM) solution can help with this issue. MDM allows you to monitor compliance with school policies and industry regulations, like CIPA (Children's Internet Protection Act). MDM allows you to track detailed information about the mobile devices, including real-time GPS location. This is an extremely useful feature to track down the iPad if it is lost or taken. MDM also lets you easily configure consistent policies, settings and restrictions across virtually any device. Among many other things, MDM is the only way you’re going to be able to handle management of all those mobile devices. If your school is considering implementing an iPad in the classroom program, we are here to help. We have worked with schools all over the country bring mobile devices like the iPad in the classroom. Just contact us here with any questions or for a free consultation. We are always happy to help!